This is indeed a proud occasion for Grenada, as we welcome President Maduro of the Bolivarian Republic of Venezuela, on his first official visit to Grenada, since assuming the presidency of Venezuela. How fitting it is to have this ceremony here at the Hugo Chávez LPG Plant, a generous gift from a visionary former leader, who contributed significantly to the development of the Latin American and Caribbean region during his remarkable life. This Plant will forever be a symbol of what he meant to us, and how much we treasure his life’s work. 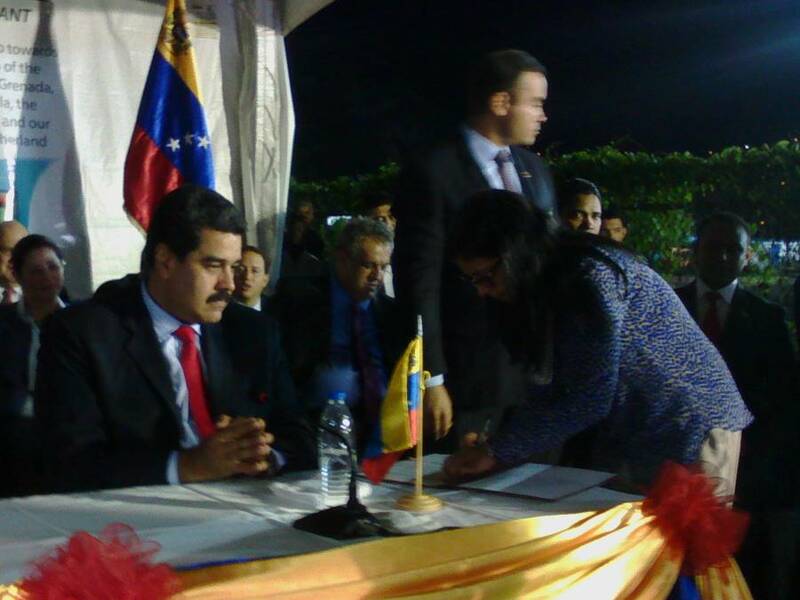 In April of this year, I was here with the Vice President of Venezuela, as we opened this Plant. Being back here today, we see how much has happened in the time since. Look around: as soon as marketing arrangements are finalized, I am assured that the cylinders will be ready for distribution by the end of the year. The Plant itself, I have been told, is the most modern in the region. As Prime Minister and Minister with responsibility for Energy, and on behalf of the Government and People of Grenada, I express wholehearted gratitude to you, our Venezuelan friends, for this gift. Coming into Office in 2013, one of the major priorities of this Government has been to find a way to ensure that the supply of energy is available, accessible and affordable to every citizen of this tri-island state. While we are nowhere near where we need to be in terms of reaching our goal, we are one step closer with this plant, and the affordable cylinders that it provides. In 2005, when our then NNP government signed the agreement that would bring us into partnership with PetroCaribe, we knew then that we needed to bring cheaper diesel to Grenlec, and that we needed to continue the quest for renewable energy sources. We might not have known how essential this was going to be to our survival, but our foresight to engage our longstanding Venezuelan friends to bring PetroCaribe here, which was eventually realized in 2007, demonstrates our clear and consistent policy regarding energy options and associated costs for our people. From what we have seen through the years, we are confident that had we not moved on that arrangement then, the costs of electricity here would have been much higher today. For that, we have to thank the late President Hugo Chávez, for his vision and conviction in helping the vulnerable in our region. This is why we commissioned the Plant in his honour, by naming it the Hugo Chávez LPG Plant. He was a consistent and loyal friend, a big brother, and he looked out, not only for his Venezuelan people, but for all the peoples of this Hemisphere. His benevolence and vision have already revolutionized our development in so many ways, and his memory remains in our hearts. 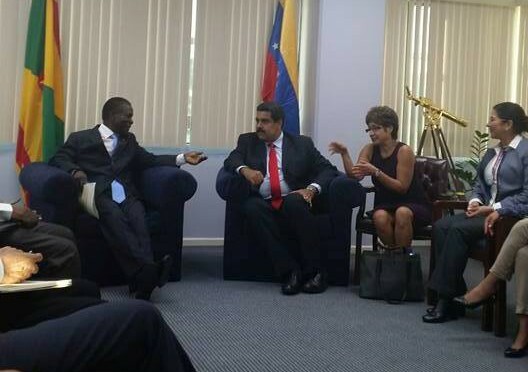 The relationship between Grenada and the Bolivarian Republic of Venezuela is one that is deeply rooted in mutual respect and a commitment to the improvement of the lives of the poorest among us. Through the years, Venezuela has assisted us in a number of areas, including the Simón Bolívar Lacalome Housing Project; the construction of the market square; the completion of the hospital; the refurbishment of the Tanteen Pavilion and the reconstruction of the Angel Harps Pan House, a project which is ongoing. Venezuela has, and continues to help with the repair of roads and bridges, across the Island. The Ford Bridge in St Andrew is an example of this. Earlier this year, the Government of Venezuela moved quickly to approve a monetary contribution for Grenada, to assist us with some of our capital expenditure programmes, such as the development of our infrastructure and the expansion of social programmes to meet the needs of our most at-risk citizens. Today, they have once again reaffirmed their commitment to helping us fulfill our promise of providing laptops and tablets to our students across the length and breadth of our Tri-Island State. This will go a long way in enhancing the competitiveness of our students on the global scale. Notably, Venezuela is also funding the reconstruction of the Eye Ward building at the General Hospital, as well as the construction of the New Wing of the General Hospital—a project which resumed late last year, and is once again ready to go with the expected receipt of US$5 million for its continuation. Today, we anticipate the signing of the Miracle Eye agreement for the provision of eye care to Grenadian nationals by Venezuelan doctors, free of cost. We acknowledge that Venezuela has its own problems; but even while they deal with theirs, they are still reaching out to help us. We are forever appreciative of that kind of commitment. We look forward to exploring other areas of cooperation, especially in the area of Agriculture. Over the years, Grenada has received fertilizer shipments and we have benefitted from Venezuela through technical assistance, scholarships and financial aid. We believe that we can increase production in agriculture through increased financing to the farmers. As a geographically close neighbor, we hope to also export much of our agriculture products to Venezuela in the near future. My friends, thank you for your consistent support in a multiplicity of areas. Rest assured that the Government and People of Grenada are dedicated to helping you in whatever way we can, in the fulfilment of your own developmental and political needs. We have observed the recent problems in Venezuela, and we believe that there is an urgent need to peacefully resolve any issues between The Bolivarian Republic and Guyana. The Government of Grenada and indeed, your CARICOM neighbours, are willing to help in that regard because we know that anything less will be disastrous for our entire region. The peace and prosperity of our region is paramount to all of us, especially if we are to leave a legacy of fraternity of which future generations can be proud and grateful. We know the late President Chávez would want nothing less. Venezuela has been a beacon of leadership in developing the integration movement among developing countries of the Hemisphere. Organizations like CELAC, ALBA, and others, continue to be platforms for solidarity and the economic development of our peoples. So today, amongst this large gathering of friends, I thank our dear friends from Venezuela for visiting us, and for their reassurance of the continuance of friendship with, and developmental assistance to the Caribbean region, and in particular, Grenada. The friendship between our two nations has progressed steadily since the establishment of diplomatic relations in 1977. We therefore look forward to deepening this relationship, not only between us, but with all our neighbours, as our governments work together for the peace and prosperity of our entire region.